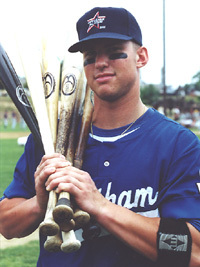 Seen here preparing for the Home Run Hitting Contest versus Team USA, Chatham A's slugger Todd Linden remained among league leaders in eight offensive categories this week. Amid a whirlwind of visiting teams, seemingly endless rainouts and countless players signing with Major League teams, the race for Cape League divisional pennants intensified this week. But not before a vaunted Team USA squad led by College Player of the Year and former Orleans Cardinal star Mark Teixeira came to Veterans Field last Saturday, much to the delight of 8,500 fans. While Teixeira may have stolen some of the pre-game headlines, his presence did not overshadow a stellar Cape League All-Star team performance, led by game Most Valuable Player Josh Persell of the Brewster Whitecaps and the brilliant pitching of Rutgers' Bob Brownlie (Falmouth), Princeton's Chris Young and Cape League save leaders Taft Cable (Orleans) and David Bush (Chatham). While the game ended in a 2-2 tie after 12 innings -- with Team USA narrowly sidestepping defeat at the hands of its hosts -- it nevertheless showed the two teams to be equally matched in more ways than one and harkened back to the 1984 Cape League All-Star versus Team USA game when Cape Cod fell, 5-4. As if in a scene from The Natural, Harwich Mariners head coach Buddy Custer gives Harwich leadoff man Adam Stern a boost of confidence before going to bat. Seeking to avenge the 1984 loss, Cape all-star head coach Mike Coutts inspired his boys back from a 2-0 deficit. 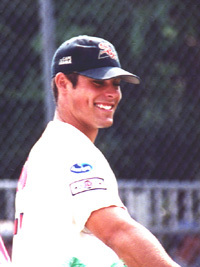 Inspirational was the word that immediately came to mind when potential 2001 number one draft pick Bob Brownlie fanned Teixeira in the first inning of play, blowing a waist-high, 95-mph heater right by the Georgia Tech star. Brownlie's one-inning, two-strikeout performance was followed by Chatham A's righty Chris Young (Princeton), who was equally impressive mixing straight heat with a nasty circle change, striking out four in two innings pitched. Then came Brewster Whitecaps' workhorse Mike Weel (1 IP, 1 H), Cotuit's Nick Glaser (Clemson) who fanned the side, but in between Ks walked one and gave up two runs and three hits, Bourne's Josh Brey, Y-D's Brandon Luna (Cypress JC), Bush and then Cable to close it out. Princeton's Chris Young brings the gas versus Team USA in Saturday's 2-2 tie at Veteran's Field. It was Cable whose 2 2/3 innings of stellar relief work wowed the crowd and gave Cape Cod hope as the game went deep into extra frames. He would wind up fanning three and allowing one walk and no runs en route to the 2-2 tie. Falmouth's Doc Brooks, Bourne's Kevin Youkilis, Brewster's Persell and Whitecaps backstop Ryan O'Toole (Notre Dame) gave the local fans something to cheer about in the late innings as all three delivered blasts that either changed or helped change the course of the game. While Brooks and O'Toole's rips were snared or just foul, Persell charged up the Cape squad with an RBI ground rule double over the left field fence in the 7th, just shy of a home run, to make it 2-1, Team USA in the lead. Brooks then scored to tie things up in the 8th when Persell (2-4) was hit by a pitch with bases loaded.Youkilis creamed one to straight-away center off the wall at the 400-mark for a two bagger in the 12th, but was left stranded. With rainouts wreaking havoc on the last leg of the Cape League 2000 regular season, things nevertheless heated up in the tight pennant race for the East Division crown, while the Hyannis Mets and Falmouth Commodores locked horns in a fight for second place dibs and a shot at battling the Wareham Gatemen for Championship Playoff rights. Brewster Whitecaps' leadoff man Steve Stanley took over the Cape League batting lead as his average climbed to .338 and the Whitecaps surged into first place. The Gatemen clinched a playoff spot Thursday night (August 3) at Brewster Whitecaps Field, thanks to another stellar effort put forth by all-star righty Ben Crockett (Harvard). Crockett fanned six batters to regain the Cape League strikeout lead (66) and up his record to 5-1 on the summer, while the remainder of the Wareham staff -- including two-year vet Pat Pinkman (5-2. 1/90 ERA) and Jonathan Gonzalez (0.47 ERA in 39 innings pitched) -- seemed primed to take the league title. Crockett went the distance in the win and also leads the league in complete games pitched (4) and total innings pitched (61). 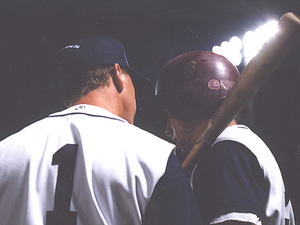 Just as it had in the summer of 1999, the Gatemen were not merely busy locking down first place and a playoff bid in the West, coach Mike Roberts' boys were busy breaking records and taking names everywhere they went, including the league team record for stolen bases in a season. While Cotuit base thief Mike Hook continued to add to his league-leading 27, Wareham's Mike Fontenot was close behind with 23, mixed in with Harwich swipe artists Adam Stern (23) and John Cole (19). Brewster Whitecaps leadoff man and Cape League all-star Steve Stanley opened some eyes this week when he overtook the league batting lead at a .331clip. Stanley was also posted among the league leaders in base thefts with 20. The Cape League Coke Hitter of the Week was Wareham's Nick Swisher (Ohio State). In four games, Swisher hit .455 (5-11) with two home runs, five RBI, two stolen bases, a slugging percentage of 1.000. In addition, Swisher was tabbed by Howe Sportsdata as the Cape League Home Run Hero of the Week for his two clout-effort. The Cape League Coke pitcher of the week was USC flamethrower Pete Montrenes, one of Chatham's top hurlers this summer. 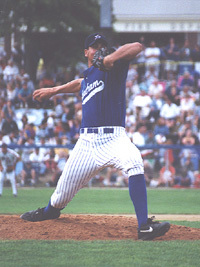 In eight innings versus the Orleans Cardinals, Montrenes struck out 15 and walked just one in helping his Chatham A's maintain a shot at the playoffs. Y-D Red Sox main man Jason Cooper was all smiles after driving in three runs in a 9-6 win over Bourne Wednesday night. The production crew of Warner Brothers upcoming film Summer Catch was on the Cape last week and is still here filming local scenery shots for next year's hopeful blockbuster about a Cape League star (Freddie Prinze Jr.) who falls in love with a local girl (Jessica Biehl). Cotuit Kettleer general manager Bruce Murphy reports several Kettleers who were drafted and signed deals with Major League Clubs this week, including Mike Schultz, Erik Threets and Daylan Holt. Wareham Gatemen relief ace Jonathan Gonzalez set a new Cape League record last Thursday against Cotuit. The righthander out of Rice University hurled four scoreless innings to up his tally to 37 2/3 scoreless innings pitched and to maintain his 0.00 earned run average. Gonzalez' record breaks last year's set by Chatham A's Derrick DePriest (37). All of the $2 programs sold at the July 22 Sprint PCS Cape League All-Star Game were sold out with the exception of 50 set aside for Cape League archives and a very limited number left available for sale in the league's web site. The Team USA-Cape League All-Star Game was a huge success in more ways than one. The game set a new Cape League 50-50 raffle record with the winning ticket sold to the parents of Bourne Braves' all-star third baseman Kevin Youkilis, a $2,500 cash payout! 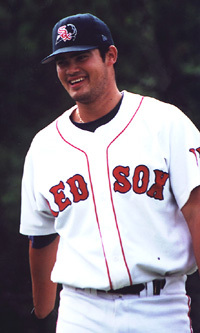 Travis Wong, Y-D's strong man, delivered two clutch RBI versus Bourne this week. 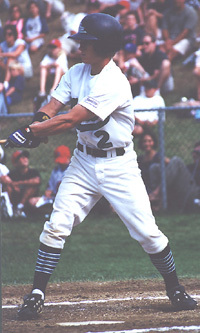 Chatham A's slugger Todd Linden was listed among the league leaders in no less than eight offensive categories, including batting average (4th, .319) and RBI (24). Meanwhile, the Hyannis Mets trio of Ryan Barthelemy (Florida State), Brian Stavisky (Notre Dame) and Brendan Harris (William & Mary) continued to hack to pieces opposing Cape League pitching. All three were posted among the league leaders in batting this week, with Barthelemy the newest to join the crowd at .301, Harris at .313 and Stavisky second in the league at .322. Stavisky also continued to lead the league in total hits with 49 after a 2-3 day against Y-D on Thursday night. Speaking of the Mets, southpaw ace Matt Coenen maintained a perfect 5-0 record with a win over the Red Sox Thursday night. Coenen, a local favorite at the Mets' kids baseball camps, also sports a nifty 1.99 earned run average and may very well prove to be the Mets' ace. The Cape League playoffs are set to begin Tuesday, August 8.